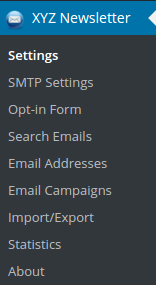 In the Newsletter Manager Plugin you can set up a list of your contacts and send emails to them. You can see the details of how to add email addresses and how to send newsletters in the coming portions. The plugin contains different sections and are listed below. After installing the Newsletter Manager plugin, please go to the wp-admin area and you can see the Newsletter Manager menu, XYZ Newsletter in the left menu section.